There simply isn't enough colorful adjectives to express my love for ModCloth. 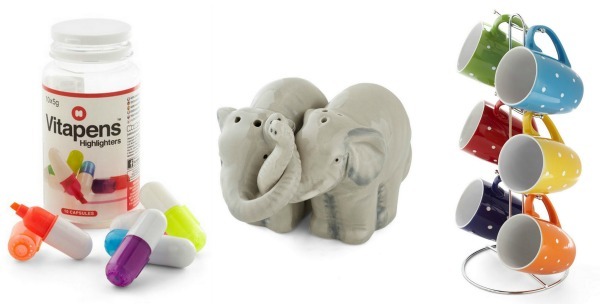 Not only do they have a fabulous variety of vintage inspired pieces, but they also have a trove of unique and adorable gifts. Today at 12pm EST they will be offering up to 40% off over 80 NEW GIIIIFFFTTT ITEMMMMMS (end Oprah impression). 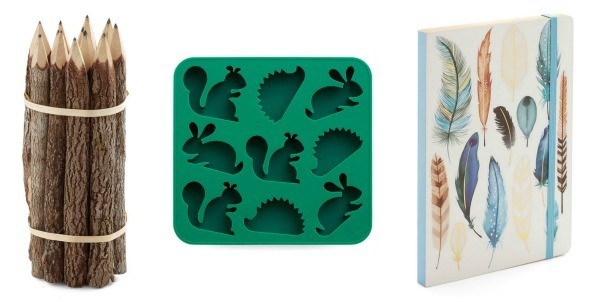 Below are some of my favorite items currently available on ModCloth.com! Love this cape, such a great piece, one of the best capes I've seen in a while! I love your bag and shoes, outfit is great! 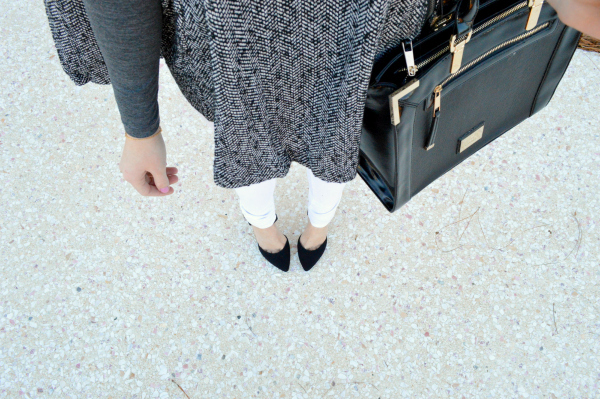 Cute cape and love the bag with it! Love the cape. You look great. Great cape! Love it paired with the white pants and black heels. You look fab. ok, now i need a cape in my life! Awesome picks! Love, love, love the accessories! omg, this cape is so chic. That cape is beyond fabulous! Love all of the details. You look great! This cape is perfection, you look beautiful! This cape is amazing! Love the way you styled it! Ob-sessed!! This cape is amazing!! Love it paired with chic white jeans and heels! Gorgeous!! This is one of my favorites, Anna. You look gorgeous. Oh my gosh this look is soo cute!! Love it! Thanks so much for visiting my blog! I love that cape! ModCloth has some really great winter items. The entire look is very city chic, polished and professional...you look great!! I need a cape now! And I love the zipper detail. So classic and gorgeous! This cape is great! I love the zipper details. Lovely bag, too. that random crap bag is a riot - all of my bags/purses contain random crap so this speaks to me. Love capes this time of year. Great way to elevate your jeans. 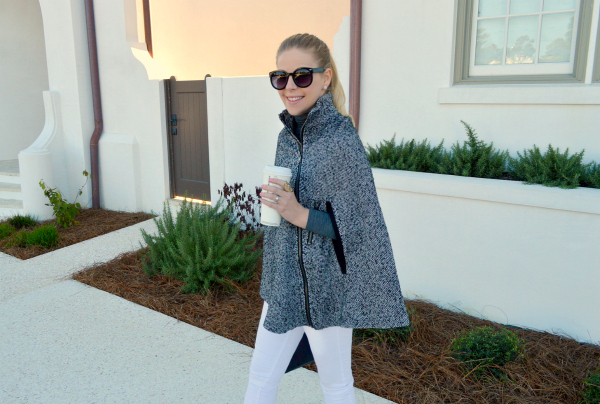 I've seen so many bloggers style capes this fall/winter, but yours might be my favorite! I really need to jump on the cape bandwagon! Girl I love this cape, and your wrapped pony to go with it! Gorgeous!! You look incredible in this cape - I love how you styled it. I keep seeing these cape coats! This one is a great choice! You look great!! Those wooden pencils are really cool. I still have a little christmas shopping left to do. thanks for sharing the sale deets. That GAPE is so cool. That cape is perfection! I love that it matches your shoes perfectly. Such a simple, clean, effortless look. I really like those white pants. I've been searching for a pair like that for a few seasons now. i am soooo in love with that gray cape,where can i get the same one.i want it so bad. Absolutely in love with this cape! 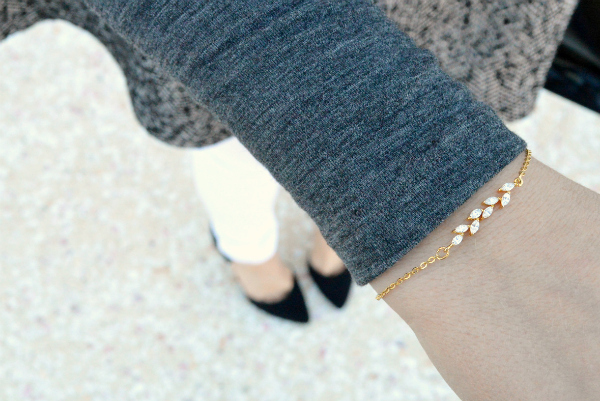 It's such a statement piece but also so versatile! I adore capes and yours is precious!! Beautiful look! That cape is gorgeous! This is so chic and classic! 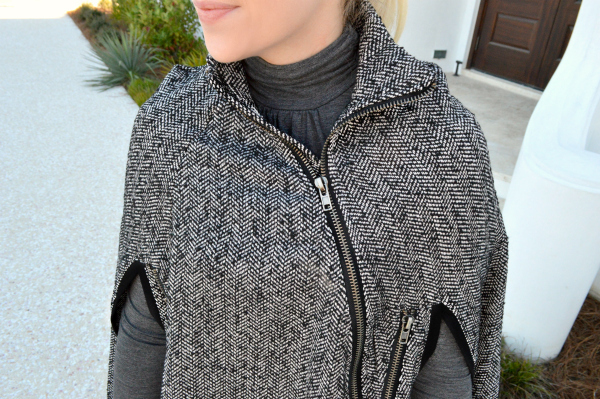 This cape is so chic, the texture is gorg! I love the sassy ponytail! The cape looks awesome, so chic. These captures are very attractive . A lot of thanks for this post .